Happy Monday, my favorite folks! I hope you all had wonderful Mother’s Day weekends! 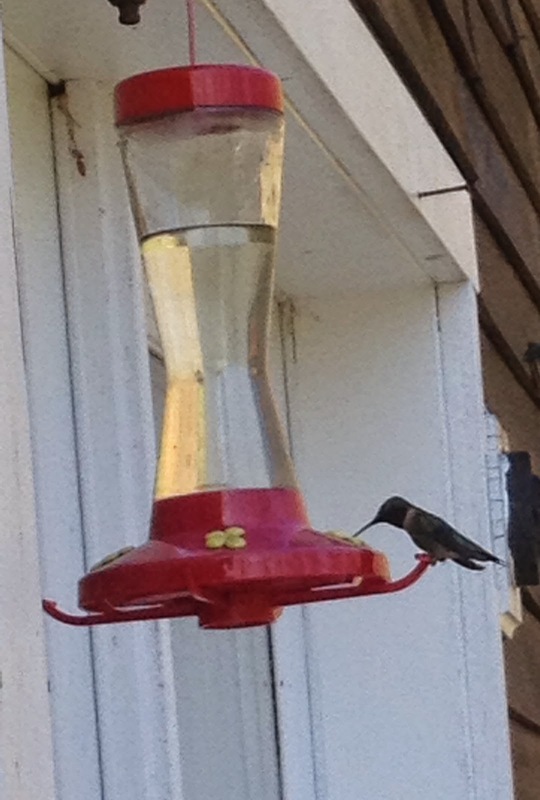 Also, did I tell you the hummingbirds are back? Every year I am amazed by how punctual they are. They show up the week of my daughter’s birthday without fail. And they’re such cheerful little critters, it’s lovely to have them around! Allow me to introduce you to my husband. A lot of the book is very funny, but it’s more than that. He managed in the end to learn some valuable lessons about life which come through beautifully in the telling. The book has been available for about a month now, and a lot of the kids at his school have read it and loved it, so I think he hit the mark pretty well. But I also know a lot of adults who have read it and loved it. It really works equally well for both audiences. Of course, I recognize that I could be a teensy bit biased 🙂 But I still think it’s a very fun book. So if you need something entertaining to read, or you know someone, child or adult, who would enjoy reading about making Viking toast on the space heater, sticking darts into the playroom ceiling tiles, and trimming the backyard grass with scissors after an unfortunate episode with rubber cement, please give it a try and spread the word! and will be on Kobo, iBooks, and Smashwords soon. Thank you for your indulgence in letting me share Eric’s book. I hope some of you will get to enjoy it! Congrats Eric! Much success with the book. I bet those hummingbirds are a delight to observe. Yes, I would read it! Sounds like a fun read. And, as a kind of bonus, your husband is a snappy dresser. What a great idea to write about all the silly, crazy, and sometimes stupid stuff most of us do when we are kids…kudos to Eric…what a writerly family you guys are. 🙂 Love the cover! Great cover! This sounds like it belongs in our house. my husband and son need some fresh ideas on how to cause mayhem. It is an achievement to write a book that kids and adults like. Bravo Eric!! You are a terrible wife . . . to have waited an entire month to promote your husband's hilarious book of near escapes and close calls. You are a terrible mother . . . to promote your husband's book to the next generation of kids eager to play with matches, lawn darts, rubber cement, and wood glue. Congratulations! It sounds like a terrific read. Thanks for the heads up! How could I pass up a title like that? Looking forward to it. I think this is such a brave title! Love it. Look forward to reading through some book in my TBR pile and then adding this. Good luck! 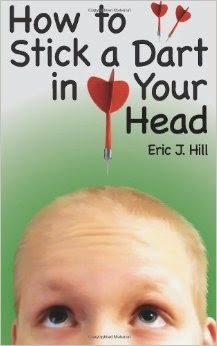 I let Dave know about Eric's Dart in the Head book too.